DALLAS, TX – The Video Association of Dallas is pleased to announce the Dallas VideoFest 27 (http://videofest.org) opening night event in partnership with the Dallas Chamber Symphony. Dallas VideoFest opens Wednesday, October 8, 2014, at Dallas City Performance Hall (2520 Flora Street, Dallas, Texas 75201) debuting Alfred Hitchcock’s first silent movie thriller, THE LODGER. 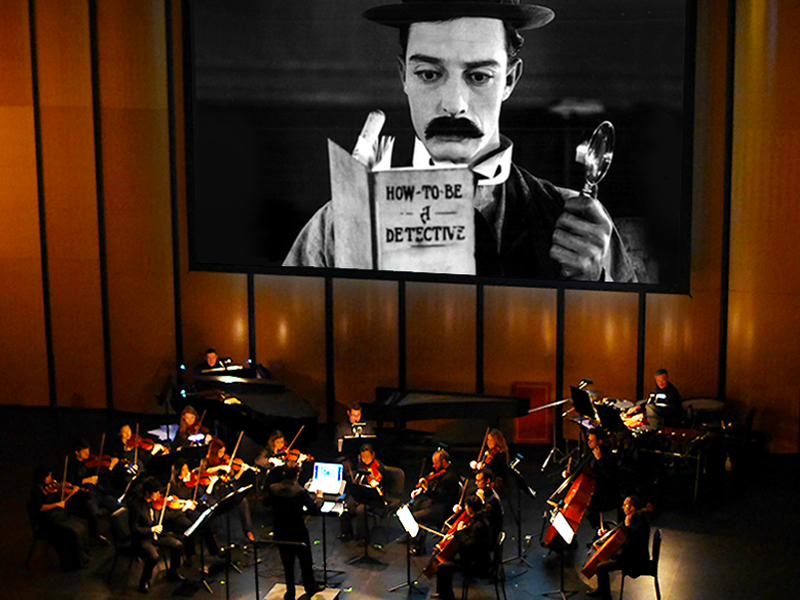 The Dallas Chamber Symphony, recently named “Best of Big D 2014” by D Magazine for “Best Way to Watch a Silent Film,” will accompany the film with a live performance of an original film score by renowned composer Douglas Pipes. DCS Artistic Director, Richard McKay, will conduct the premiere. THE LODGER was recently restored by the British Film Institute along with eight other films of Hitchcock’s earliest surviving work. “We are so proud and happy to be working with the Dallas Chamber Symphony, for the screening and performance of THE LODGER. We hope this is the beginning of a long relationship with the Chamber Symphony. I know that both audiences will love the experience of the evening. We are also so happy to be having our opening night at the prestigious Dallas City Performance Hall,” said Bart Weiss, artistic director, Dallas VideoFest and founder of Video Association of Dallas. “We could not be happier to be joining forces with the Video Association of Dallas to co-present THE LODGER on opening night of VideoFest 27. There is nothing quite like watching a classic silent film to live orchestral music, and our film composer, Douglas Pipes is an extraordinary talent who will bring new life to this incredible classic film. Our new partnership is an exciting ongoing collaboration — one that will continue to enrich the Dallas arts scene for years to come,” said Richard McKay, artistic director and founder of the Dallas Chamber Symphony. Douglas Pipes (http://www.douglaspipes.com/) is a film composer in Los Angeles, whose feature films include the Academy Award nominated Sony animated feature MONSTER HOUSE and Warner Bros./Legendary Films cult hit TRICK ‘R TREAT. His awards include “Compositor Revalacion” at the 3rd International Film Music Conference in Ubeda, Spain and “Best Animation” at the Royal Television Society in the United Kingdom. Nominations include “Discovery of the Year” at the 2006 World Soundtrack Awards in Ghent, Belgium, “Best Music” at the 2007 Saturn Awards, and “Best Horror Score” and “Best New Composer” from the International Film Music Critics Association (2006 and 2009). The Dallas Chamber Symphony has become renowned for its film concerts, which pair classic silent movies with newly commissioned musical scores. 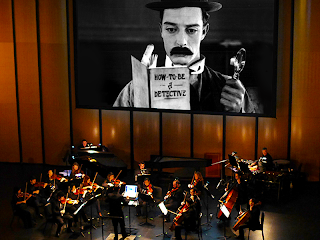 Within the past two years, the Dallas Chamber Symphony has commissioned and performed the premieres of six new musical compositions to screenings of classic silent movies. Composers for the films have worked on numerous big-screen features such as THE LONE RANGER, ENDER’S GAME and ELYSIUM. Brian Satterwhite’s score for the Harold Lloyd film, A SAILOR-MADE MAN, was a finalist for the prestigious Jerry Goldsmith Award and garnered praise from the Harold Lloyd estate. The film concert series is a multi-faceted initiative that entails the selection of classic silent films, the commissioning of an original musical score from a professional film composer, and a live performance, in which the orchestra synchronize the music to the action on screen to the delight of audiences at Dallas City Performance Hall. The chamber orchestra has focused on screening the silent film works of the masters of early cinema. Concert screenings have debuted new scores to Harold Lloyd’s, ASK FATHER and A SAILOR-MADE MAN, Buster Keaton’s THE SCARECROW and SHERLOCK JR., Charlie Chaplin’s BY THE SEA, and Robert Weine’s THE CABINET OF DR. CALIGARI—acknowledged as the first horror film ever made. Named Best of Big D 2014 by D Magazine, and Best Classical Music Addition 2013 by the Dallas Observer, the Dallas Chamber Symphony is one of the most exciting and innovative professional performance ensembles in North Texas. Led by Artistic Director and Conductor Richard McKay, it is comprised of 40 musicians, all dedicated to building a chamber orchestra whose mission is to perform a balance of programs that include underrepresented and standard repertory, contemporary music, staged works, and pieces with extra-musical elements, such as film, actors, dancers, and narrators. Alamo Drafthouse Cinema–Richardson; Alford Media Services, Inc.; AMS Pictures; Angelika Film Center Dallas; City of Richardson through the Richardson Arts Commission; Common Desk; Dallas Convention & Visitors Bureau; Dallas Film Commission; Dallas Office of Cultural Affairs; FilmFreeway; KERA/KXT; KellyKitchensPR.com; Selig Polyscope Company; Sell.com; SullivanPerkins; Texas Commission on the Arts; Texas Film Commission; and TheaterJones.com. The mission of the Video Association is to promote an understanding of video as a creative medium and cultural force in our society, and to support and advance the work of Texas artists working in video and the electronic arts. The Video Association of Dallas (VAD) is a 501(c)(3) organization incorporated on April 25, 1989. It began in 1986 as a weekend event, “Video As A Creative Medium”, presented at the Dallas Museum of Art by independent curators Barton Weiss and John Held. That first event, which included two nights of video by selected local and national video artists, was a great popular success, which led to the founding of the Dallas VideoFest (DVF) in 1987. Video Association of Dallas also presents the 24-Hour Video Race, the Texas Show Tour, North Texas College Film Festival, Texas Fllmmakers Production Fund workshops, Three Star Cinema, and other programs throughout the year.